NOTES FROM THE WILD WEST. 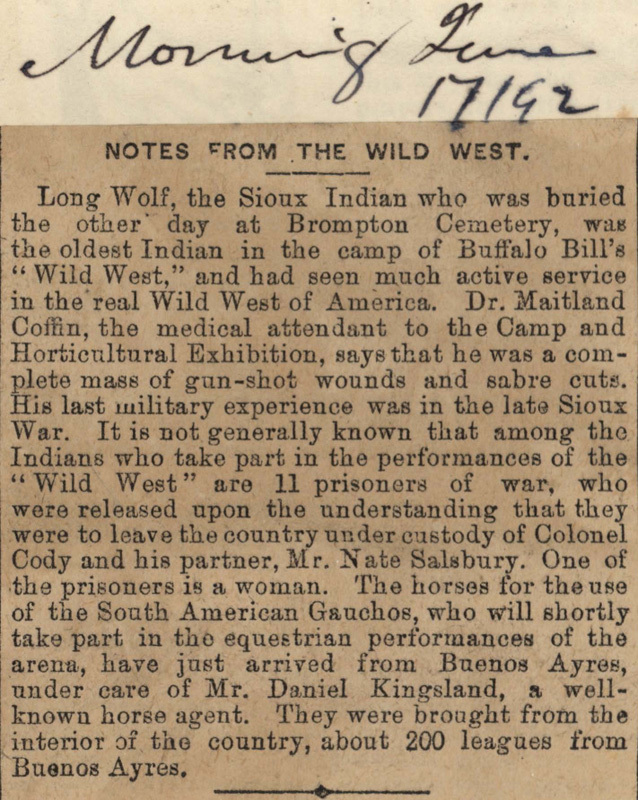 Long Wolf, the Sioux Indian who was buried the other day at Brompton Cemetery, was the oldest Indian in the camp of Buffalo Bill's "Wild West," and had seen much active service in the real Wild West of America. Dr. Maitland Coffin, the medical attendant to the Camp and Horticultural Exhibition, says that he was a complete mass of gun-shot wounds and sabre cuts. His last military experience was in the late Sioux War. 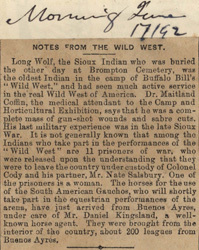 It is not generally known that among the Indians who take part in the performances of the "Wild West" are 11 prisoners of war, who were released upon the understanding that they were to leave the country under custody of Colonel Cody and his partner, Mr. Nate Salsbury. One of the prisoners is a woman. The horses for the use of the South American Gauchos, who will shortly take part in the equestrian performances of the arena, have just arrived from Buenos Ayres, under care of Mr. Daniel Kingsland, a well-known horse agent. They were brought from the interior of the country, about 200 leagues from Buenos Ayres.